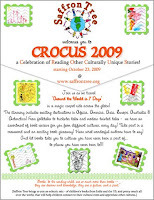 CROCUS 2009: Around the World in Seven Days. 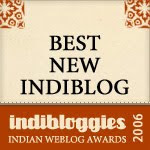 Our first annual children's blog-book festival started as an abstract idea with a driving urge to host an online festival to foster the love of reading. As it gathered shape and form, our collective thoughts settled on the need for a theme. 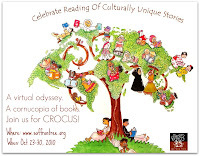 The love for travel and connecting with the world was compelling enough that by end of summer 2009 the small group of nine contributors had settled on the theme, eager to hand-pick books to review and present at the festival. 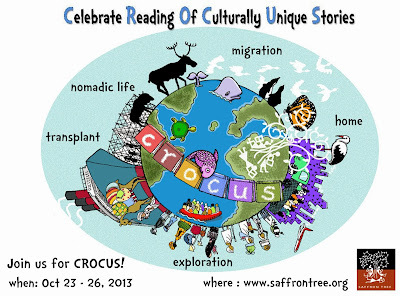 CROCUS was planted and harvested together as a team. Culture can be viewed in terms of its constituent elements - food, dress, language, customs, lifestyles, music, dance, art forms,legends and so on. It is these diverse forms of expressions that we attempted to understand as part of our CROCUS festival of 2010. The colourful threads of diverse cultural forms woven into the beautiful fabric of humanity highlight the fact that despite all our differences we are still one. This universal truth can be explained through these wonderful books to our budding little citizens of the world. 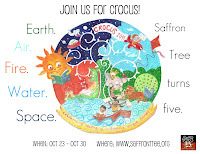 CROCUS 2011: A Tribute to the Five Elements: Earth, Air, Fire, Water, Space. 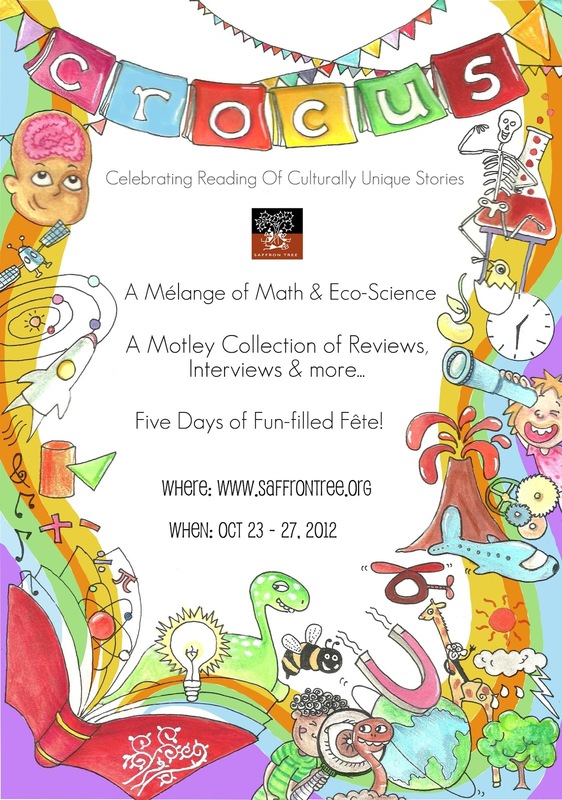 As Saffron Tree turns a glorious 5 years, it seems fitting to pay tribute to the 5 elements that we all have in common. It has different names, but a connected thread of resonance for all of us. Because these very elements are within us as well, forming the cradle of our life force. To acknowledge and understand these 5 universal elements, and the roles they play in our lives, was the motivation for CROCUS 2011. And, to find a balance and put things in perspective, we dedicated part of the festival to celebrating our earth via Eco-science books to pass on the awareness to our children. Migration, exploration, moving in search of a better life, across histories, geographies, cultures, setting down roots in a new habitat - it is a all way of all life. Why not, then, look at stories of these migrations? Humans have migrated for all sorts of reasons. Moving just that much more ahead to find food and shelter. Getting away from an area that has been affected by natural or man-made disasters. Finding new land to settle in when population exploded as an indirect result of the discovery of cultivation and establishment of agriculture. Exploration of new territories - either for conquest, expanding kingdoms, in the name of religion, in search of different cultures, for adventure, for trade, or just to plunder. We looked at animal and human migration and our boundless energy for exploration that led to the moon landing and Mars rovers - things that only we, humans, continue to do because we are not happy staying put. We stand before the Taj Mahal listening to a tourist guide tell us the story of Shahjahan’s love for Mumtaz Mahal and how the marble from Makrana in Rajasthan was transported to Agra in carts drawn by camels. That is history. When your mother puts green chillies in the potato curry we remember that we only began to use chillies and potatoes after the Portuguese introduced them into India. These gifts from their colonies in Mexico and South America included chillies, potatoes, tomatoes, pineapples, peanuts, cashew nuts... that is our culinary history. When Anushka Ravi Shankar plays Rag Mian ki Malhar on her sitar, she is playing a raga created by Mian Tansen who was the court singer of Emperor Akbar. That is our musical history. Our kids have many resources at hand that show them the lively past, so they can draw parallels and contrasts, analyze and examine the civilizations and personas that shaped their present self. With this kind of exposure, there is now room for curiosity to flourish, and respect to blossom. In that spirit, we bring you a week dedicated to books that embrace this philosophy and showcase History in full glory. We start at the very beginning, opening the curtains to when dinosaurs roamed the earth and Neanderthal man carved a life for himself in the wild. We leap into tantalizing Mesopotamia and surrounding region where we'll be wowed by the Pyramids and Grecian architecture. 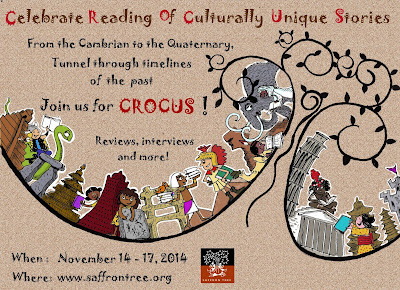 Not far away lies Rome and a hop across continents will bring us to ancient civilizations. Every day, we will be talking to authors and publishers who have brought these stories alive for us. And, with the lessons from the past, we will look to a bright future, where history is no longer mindless or impersonal. Come, read our reviews, earmark the ones your family will enjoy and bring them home to read together. History's many stories are waiting to be explored, one story at a time.